In the Glorious Revolution of 1688, a group of English Parliamentarians invited the Dutch stadtholder William III of Orange-Nassau (William of Orange) to overthrow King James II of England (James VII of Scotland and James II of Ireland). William’s successful invasion with a Dutch fleet and army led to James fleeing to France. The reality of course is very different from what history projects. 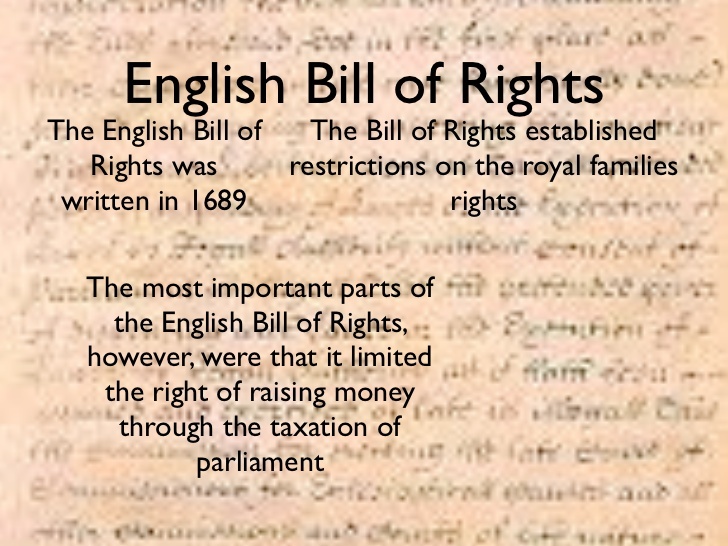 It was about shifting the real Common Law of England, as derived from the Word of God, into the hands of commerce. All that would follow the Dutch Sabbatean backed Cromwellian introduction of Parliamentary democracy, governed by its creditor, the soon to be Bank of England, under Admiralty Law… would be debt. Let us not forget that Cromwell called for a Commonwealth of Whig controlled debt forming Parliaments, to be spread across the globe by the East India Companies (Templar Navy) and subsidiaries. The proposal to draw up a statement of rights and liberties and James’s violation of them was first made on 29 January 1689 in the House of Commons, with members arguing that the House “can not answer it to the nation or Prince of Orange till we declare what are the rights invaded” and that William “cannot take it ill if we make conditions to secure ourselves for the future” in order to “do justice to those who sent us hither”. On 2 February a committee specially convened reported to the Commons 23 Heads of Grievances, which the Commons approved and added some of their own. However on 4 February the Commons decided to instruct the committee to differentiate between “such of the general heads, as are introductory of new laws, from those that are declaratory of ancient rights”. On 7 February the Commons approved this revised Declaration of Right, and on 8 February instructed the committee to put into a single text the Declaration (with the heads which were “introductory of new laws” removed), the resolution of 28 January and the Lords’ proposal for a revised oath of allegiance. It passed the Commons without division. On 13 February the clerk of the House of Lords read the Declaration of Right and Halifax, in the name of all the estates of the realm, asked William and Mary to accept the throne. William replied for his wife and himself: “We thankfully accept what you have offered us”. They then went in procession to the great gate at Whitehall. The Garter King at Arms proclaimed them King and Queen of England, France and Ireland, whereupon they adjourned to the Chapel Royal, with Compton preaching the sermon. They were crowned on 11 April, swearing an oath to uphold the laws made by Parliament. The Coronation Oath Act 1688 had provided a new coronation oath, whereby the monarchs were to “solemnly promise and swear to govern the people of this kingdom of England, and the dominions thereunto belonging, according to the statutes in parliament agreed on, and the laws and customs of the same”. They were also to maintain the laws of God, the true profession of the Gospel, and the Protestant Reformed faith established by law. This replaced an oath which had deferred more to the monarch. The previous oath required the monarch to rule based on “the laws and customs … granted by the Kings of England”. by making “several grants and promises made of fines and forfeitures before any conviction or judgment against the person, upon whom the same were to be levied”. Parliaments should be held frequently. In a prelude to the Act of Settlement to come twelve years later, the Bill of Rights barred Roman Catholics from the throne of England as “it hath been found by experience that it is inconsistent with the safety and welfare of this Protestant kingdom to be governed by a papist prince”; thus William III and Mary II were named as the successors of James II and that the throne would pass from them first to Mary’s heirs, then to her sister, Princess Anne of Denmark and her heirs (and, thereafter, to any heirs of William by a later marriage). And they do claim, demand and insist upon all and singular the premises as their undoubted rights and liberties, and that no declarations, judgments, doings or proceedings to the prejudice of the people in any of the said premises ought in any wise to be drawn hereafter into consequence or example; to which demand of their rights they are particularly encouraged by the declaration of his Highness the prince of Orange as being the only means for obtaining a full redress and remedy therein. Having therefore an entire confidence that his said Highness the prince of Orange will perfect the deliverance so far advanced by him, and will still preserve them from the violation of their rights which they have here asserted, and from all other attempts upon their religion, rights and liberties, the said Lords Spiritual and Temporal and Commons assembled at Westminster do resolve that William and Mary, prince and princess of Orange, be and be declared king and queen of England, France and Ireland and the dominions thereunto belonging, to hold the crown and royal dignity of the said kingdoms and dominions to them, the said prince and princess, during their lives and the life of the survivor to them, and that the sole and full exercise of the regal power be only in and executed by the said prince of Orange in the names of the said prince and princess during their joint lives, and after their deceases the said crown and royal dignity of the same kingdoms and dominions to be to the heirs of the body of the said princess, and for default of such issue to the Princess Anne of Denmark and the heirs of her body, and for default of such issue to the heirs of the body of the said prince of Orange. And the Lords Spiritual and Temporal and Commons do pray the said prince and princess to accept the same accordingly. Upon which their said Majesties did accept the crown and royal dignity of the kingdoms of England, France and Ireland, and the dominions thereunto belonging, according to the resolution and desire of the said Lords and Commons contained in the said declaration. And thereupon their Majesties were pleased that the said Lords Spiritual and Temporal and Commons, being the two Houses of Parliament, should continue to sit, and with their Majesties’ royal concurrence make effectual provision for the settlement of the religion, laws and liberties of this kingdom, so that the same for the future might not be in danger again of being subverted, to which the said Lords Spiritual and Temporal and Commons did agree, and proceed to act accordingly. Now in pursuance of the premises the said Lords Spiritual and Temporal and Commons in Parliament assembled, for the ratifying, confirming and establishing the said declaration and the articles, clauses, matters and things therein contained by the force of law made in due form by authority of Parliament, do pray that it may be declared and enacted that all and singular the rights and liberties asserted and claimed in the said declaration are the true, ancient and indubitable rights and liberties of the people of this kingdom, and so shall be esteemed, allowed, adjudged, deemed and taken to be; and that all and every the particulars aforesaid shall be firmly and strictly holden and observed as they are expressed in the said declaration, and all officers and ministers whatsoever shall serve their Majesties and their successors according to the same in all time to come. And the said Lords Spiritual and Temporal and Commons, seriously considering how it hath pleased Almighty God in his marvellous providence and merciful goodness to this nation to provide and preserve their said Majesties’ royal persons most happily to reign over us upon the throne of their ancestors, for which they render unto him from the bottom of their hearts their humblest thanks and praises, do truly, firmly, assuredly and in the sincerity of their hearts think, and do hereby recognise, acknowledge and declare, that King James the Second having abdicated the government, and their Majesties having accepted the crown and royal dignity as aforesaid, their said Majesties did become, were, are and of right ought to be by the laws of this realm our sovereign liege lord and lady, king and queen of England, France and Ireland and the dominions thereunto belonging, in and to whose princely persons the royal state, crown and dignity of the said realms with all honours, styles, titles, regalities, prerogatives, powers, jurisdictions and authorities to the same belonging and appertaining are most fully, rightfully and entirely invested and incorporated, united and annexed. And for preventing all questions and divisions in this realm by reason of any pretended titles to the crown, and for preserving a certainty in the succession thereof, in and upon which the unity, peace, tranquility and safety of this nation doth under God wholly consist and depend, the said Lords Spiritual and Temporal and Commons do beseech their Majesties that it may be enacted, established and declared, that the crown and regal government of the said kingdoms and dominions, with all and singular the premises thereunto belonging and appertaining, shall be and continue to their said Majesties and the survivor of them during their lives and the life of the survivor of them, and that the entire, perfect and full exercise of the regal power and government be only in and executed by his Majesty in the names of both their Majesties during their joint lives; and after their deceases the said crown and premises shall be and remain to the heirs of the body of her Majesty, and for default of such issue to her Royal Highness the Princess Anne of Denmark and the heirs of the body of his said Majesty; and thereunto the said Lords Spiritual and Temporal and Commons do in the name of all the people aforesaid most humbly and faithfully submit themselves, their heirs and posterities for ever, and do faithfully promise that they will stand to, maintain and defend their said Majesties, and also the limitation and succession of the crown herein specified and contained, to the utmost of their powers with their lives and estates against all persons whatsoever that shall attempt anything to the contrary. And whereas it hath been found by experience that it is inconsistent with the safety and welfare of this Protestant kingdom to be governed by a popish prince, or by any king or queen marrying a papist, the said Lords Spiritual and Temporal and Commons do further pray that it may be enacted, that all and every person and persons that is, are or shall be reconciled to or shall hold communion with the see or Church of Rome, or shall profess the popish religion, or shall marry a papist, shall be excluded and be for ever incapable to inherit, possess or enjoy the crown and government of this realm and Ireland and the dominions thereunto belonging or any part of the same, or to have, use or exercise any regal power, authority or jurisdiction within the same; and in all and every such case or cases the people of these realms shall be and are hereby absolved of their allegiance; and the said crown and government shall from time to time descend to and be enjoyed by such person or persons being Protestants as should have inherited and enjoyed the same in case the said person or persons so reconciled, holding communion or professing or marrying as aforesaid were naturally dead; and that every king and queen of this realm who at any time hereafter shall come to and succeed in the imperial crown of this kingdom shall on the first day of the meeting of the first Parliament next after his or her coming to the crown, sitting in his or her throne in the House of Peers in the presence of the Lords and Commons therein assembled, or at his or her coronation before such person or persons who shall administer the coronation oath to him or her at the time of his or her taking the said oath (which shall first happen), make, subscribe and audibly repeat the declaration mentioned in the statute made in the thirtieth year of the reign of King Charles the Second entitled, _An Act for the more effectual preserving the king’s person and government by disabling papists from sitting in either House of Parliament._ But if it shall happen that such king or queen upon his or her succession to the crown of this realm shall be under the age of twelve years, then every such king or queen shall make, subscribe and audibly repeat the same declaration at his or her coronation or the first day of the meeting of the first Parliament as aforesaid which shall first happen after such king or queen shall have attained the said age of twelve years. All which their Majesties are contented and pleased shall be declared, enacted and established by authority of this present Parliament, and shall stand, remain and be the law of this realm for ever; and the same are by their said Majesties, by and with the advice and consent of the Lords Spiritual and Temporal and Commons in Parliament assembled and by the authority of the same, declared, enacted and established accordingly. II. And be it further declared and enacted by the authority aforesaid, that from and after this present session of Parliament no dispensation by _non obstante_ of or to any statute or any part thereof shall be allowed, but that the same shall be held void and of no effect, except a dispensation be allowed of in such statute, and except in such cases as shall be specially provided for by one or more bill or bills to be passed during this present session of Parliament. 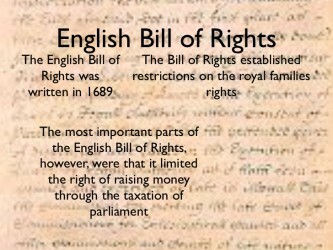 1] The Act is cited as “The Bill of Rights” in the United Kingdom, as authorised by section 1 of, and the First Schedule to, the Short Titles Act 1896. Owing to the repeal of those provisions, it is now authorised by section 19(2) of the Interpretation Act 1978. In the Republic of Ireland, it is cited as “The Bill of Rights 1688”, as authorised by section 1 of, and the First Schedule to, the Short Titles Act 1896 (as amended by section 5(a) of the Statute Law Revision Act 2007). The short title of this Act was previously “The Bill of Rights. 3] Arguably, this right is subject to continuing derogation in modern times; see, for example, Armed Forces Act and discussion of the same in Military Covenant. 1] Thatcher, Oliver Joseph (ed.) (1907). The library of original sources. University Research Extension. p. 10. 2]“Bill of Rights 1689“. House of Commons Library. 5 October 2009. p. 3. Retrieved 1 March 2015. 3] Schwoerer, Lois G. (October 1990). “Locke, Lockean Ideas, and the Glorious Revolution“. Journal of the History of Ideas (University of Pennsylvania Press) 51 (4): 531548. Retrieved 5 March 2015. 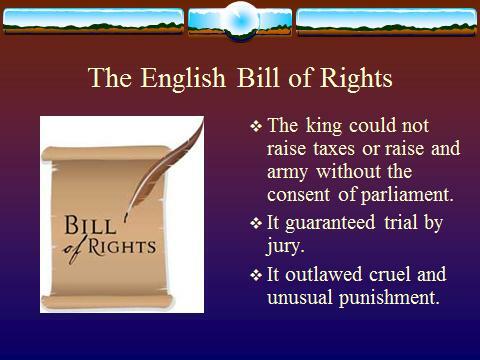 4] “Facts About the Bill of Rights on Its 220th Anniversary“. History.com. 15 December 2011. Retrieved 29 September 2012. 5] Toporoski, Richard (Summer 1996). “Monarchy Canada: The Invisible Crown“. Archived from the original on 1997-06-17. 6] Horwitz 1977, p. 12. 7] Carpenter 1956, pp. 145 146. 9] “The Convention and Bill of Rights“. UK Parliament. Retrieved 2 November 2014. 10] Williams 1960, p. 26. 11] Williams 1960, p. 27. 12] Williams 1960, pp. 28 29.